Roland’s new FP-10 piano is an excellent entry-level piano for any age. Here’s an in-depth look in this Roland FP-10 review. The latest entry in Roland’s FP piano series, the Roland FP-10 piano is one of the most affordable and most authentic sounding entry-level portable digital pianos currently on the market. It's the new entry-level model for Roland’s digital pianos, substituting for the pricier FP-30. Upon first glance, it certainly looks like a solidly-built, easy to use entry-level digital piano. Let’s see if its features live up to the Roland name in this full Roland FP-10 review. As mentioned above, the FP-10 replaces the FP-30 as the entry-level model in Roland’s line of digital pianos. The newest weighted keyboard on the market today, the FP-10 is chock-full of a variety of features that give it full-size, authentic acoustic sound in a compact digital size. We’ll explore the FP-10’s unique qualities here. Roland’s PHA-4 Standard Keyboard is just one of the parts of the Roland FP-10 that make it stand out from other digital pianos on the market. It is full-sized at 88 notes and is designed to give the user the experience of the feel and sound of an acoustic piano, expressing even subtle differences in tone and dynamics. This is accomplished through its weighted keyboard, which highlights a lighter hammer weight in the higher register keys and a heavier one in the lower register keys. The keys are made of a material that absorbs moisture and provides the user with the feel of real ivory. The feel will be familiar to piano players who are used to playing the Roland FP-30. The FP-10’s lower price point, however, makes it the best entry-level weighted keyboard for the money. 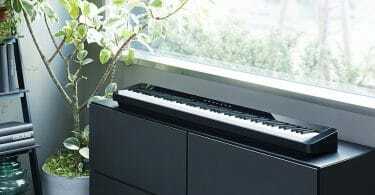 Just like the FP-30, the FP-10 digital piano utilizes Roland’s dynamic SuperNATURAL sound engine, with its built-in stereo speakers providing full-room sound. This technology is designed to evoke realistic, expressive sounds from digital pianos, emitting authentic tones and sounds. When listening through headphones, the sounds coming from the FP-10 are indistinguishable from the sounds of the pricier FP-30. The maximum polyphony of the FP-10 digital piano is 96 voices, and it contains 15 sounds (with four different piano sounds). The polyphony includes a built-in metronome, which is quite handy for both beginning piano learners and more advanced musicians. The FP-10 also allows you to play two sounds simultaneously using the keyboard’s function button. The wide variety of sounds available on the FP-10 are all quite authentic and sound surprisingly real. The Roland FP-10 features a wide variety of connectivity types for an entry-level digital piano. These types include Bluetooth, USB MIDI and regular MIDI. Roland’s popular Piano Partner 2 app is easily accessible from the FP-10. The FP-10 digital piano can even be used as a Bluetooth MIDI controller if you so desire. The FP-10 is also equipped with one headphone jack. Another interesting feature of the Roland FP-10 is its Twin Piano Mode. Designed mainly to be used by piano teachers and students, this mode allows the student and teacher to play the same range of notes while sitting beside each other. The piano is essentially split into halves, with two players sitting side by side, each playing their “half” of the piano. The FP-10 digital piano is designed to be portable, weighing in at about 38 lbs., yet still incorporating a full-size 88-key keyboard. Its versatility means that it can be used in homes in which you have limited space, in the studio, for traveling gigs, and in the classroom. While it makes a great first piano for students, its price point also makes it the perfect second piano for more advanced pianists. Roland’s own Piano Partner 2 app, compatible with both iOS and Android smartphones. This useful application allows you, the user, to record yourself playing, keep a diary of your performances, set a metronome and select sounds, all from your smartphone. Other unique features in the Piano Partner 2 app include the ability to build skills through flash cards and to see the FP-10’s internal collection of music on your smartphone. This free app is available from Apple’s App Store or Google Play. Apple’s popular GarageBand app is also compatible with the FP-10. It allows you to use your Mac as a studio in which to create music. It is perfect for beginning music producers as well as a seasoned ones. A wide variety of Digital Audio Workstations (DAWs) can be connected to the FP-10. 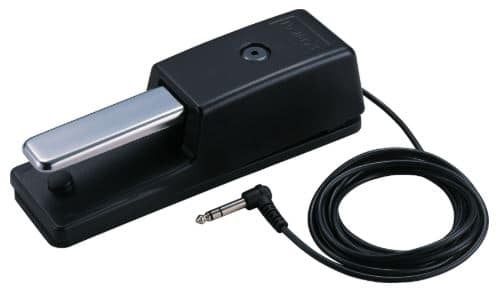 The optional DP-10 damper pedal (found here on Amazon), when connected to the Roland FP-10, can provide pedaling techniques, such as half-pedaling, that are commonly found on only the finest acoustic pianos. This gives the FP-10 digital piano an even more authentic piano quality sound. The pedal features a non-slip plate made of rubber and, for more advanced musicians, a 2.2-meter cable that is designed to serve multi-keyboard stacked setups quite well. The KSCFP-10 stand is a custom stand that was crafted especially for the Roland FP-10 piano. It is solidly built and offers a way to make your portable digital piano more stationery, if that’s what you prefer. Another optional accessory for the Roland FP-10 piano is the CB-88RL carrying bag. This protective case provides the ultimate in keyboard storage and helps you to transport your digital piano more securely, easily and safely. The carrying bag was designed to fit all 88-key Roland digital pianos including the FP-10. At the time of writing this article, the Roland FP-10 sells in the $600 range. This price places the FP-10 solidly in the middle of the pack of the price range of the best weighted keyboards. Its unique features and amazing sound make it well worth the money. The Alesis Recital 88-Key Beginner Digital Piano is one of the most popular weighted keyboards on the market that has traditionally been targeted to buyers who are beginning piano players. Its full size is comparable to that of the Roland FP-10 (both with 88 keys), as is its portability (the Alesis weighs about 15 lbs., whereas the Roland FP-10 weighs in a bit heavier at 38 lbs.). However, when it comes to sound quality, there is absolutely no comparison between the two. 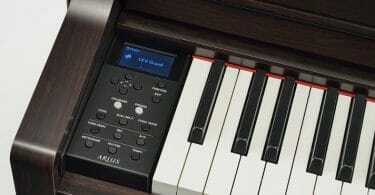 The Alesis Recital has the pleasant piano-like sound that you would expect from an entry-level weighted keyboard. The FP-10’s sound is much richer and more authentic, which, to me, makes it preferable to the Alesis Recital. What if we compare the Roland FP-10 to another portable weighted keyboard in the same price range? The Yamaha P-125 88-Key Weighted Action Digital Piano was once the gold standard for the best in its class; that is, until the Roland FP-10 debuted. The Yamaha P-125 has an authentic piano sound, just as the Roland FP-10 does. It is also a full 88 keys, like the FP-10, and both digital piano models connect to many useful applications. The Roland FP-10, however, comes with the Roland name, which is quite meaningful to professional musicians and experts in the digital piano field. You get more “bang for your buck” with the Roland FP-10, which is why I would choose it over the Yamaha P-125. Yet another weighted digital keyboard around the same price point as the FP-10 is the Korg B1SP 88 Weighted Key Digital Piano. It has 88 keys, just like the FP-10, and carries the sound of an acoustic piano, as the FP-10 also does. However, the Korg B1 is almost twice as heavy as the Roland FP-10, making it much harder to transport. For its greater portability alone, I would choose the Roland FP-10 over the Korg B1 (which was my original choice for best overall weighted keyboard). After examining the features and price of the Roland FP-10 digital piano, I think that it is the best weighted digital piano available at its price point right now. Packed with features, the FP-10 is the best entry-level digital piano on the market. Check out its price and learn more details here. The Roland FP-10 does cost a bit more than some comparable entry-level weighted keyboards. However, its innovative technology, myriad of features, and awesome sounds make it well worth its price tag. To compare the Roland FP-10 to other Roland keyboards that are for sale, check out this article.